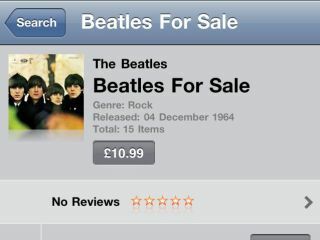 Beatles on iTunes. So what? That was the announcement we waited for? Do you remember where you were when Apple made its world changing, unforgettable Beatles announcement? I was right here, on this chair, in front of this computer, making this face: meh. I suspect you were doing something similar. To most of us, the arrival of The Beatles on iTunes is as exciting as the news that Andrex has switched its bog roll colour from white to Winter White. It's something that simply doesn't matter. *That* was the announcement US Apple fans got up early for? No streaming iTunes, TV rentals or mind-brain interface? Old guys' music is now available in a shop? Part of it is The Beatles themselves. I'd agree that they were the most important band of all time, but the kids don't care: it's old people's music, as much a part of young people's lives as whittling, spats or the Black Death. Even Britpop, which briefly made The Fab Four cool again, was a very, very long time ago. The trouble with old people's music is that old people already have it. If you're a fan you'll already have the albums on vinyl, or CD, or reissued CD, or remastered CD, or reissued remastered reissued best of compilation box set volume three. There hasn't exactly been a shortage of Beatles products over the last few decades - and almost all of it is available more cheaply on CD than it is on iTunes today. And then, of course, there are the torrents. If I had a penny for every person currently seeding the Beatles' entire discography or one of their best-ofs, I could afford to graft a badger to my head just like Paul McCartney appears to have done. I find it hard to believe that anyone has spent the last decade desperately waiting for the Beatles to hit iTunes, and I shudder to think how much money has been lost to the torrents and P2P nets while Apple (Corp) and Apple (computer) have bickered. Despite all of that, I can't stop thinking that Apple's iTunes announcement was still pretty brilliant. The hyperbolic teaser demonstrated genuine excitement, and its placement on Apple.com shows that to at least one person, The Beatles on iTunes is a really big deal. That person, of course, is Steve Jobs. In a business where shareholder returns matter more than songs, it's nice to know that the CEO of the world's biggest music retailer actually cares about - and still gets excited about - music.